We all know that alcohol is linked to health problems. The range and scale of those harms is far wider than many of us think. In particular, drinking very heavily brings with it a number of serious physical risks. This special publication provides a clear and detailed overview of those risks, as well as advice for people likely to encounter such problems in their day-to-day work. Would you like printed copies for your organisation? The publication was a printed supplement in the June 2018 DDN magazine, but we would be happy to post additional copies to your organisation free of charge to distribute to members of staff. Please fill in the form below. 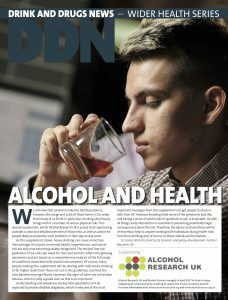 Order free copies of DDN Alcohol and Health for your organisation. To help us grow our free distribution please let us know how you heard about the publication.